First 'The Walking Dead' Season 9 Promo Image Features Rick Grimes, Washington D.C. The first official look at The Walking Dead Season Nine shows a new look at the key characters and a brand new city. Released by Fox, the network which airs Robert Kirkman's zombie show, a promo image for the new season sees a brand look for Rick Grimes, standing at the forefront ahead of Maggie and Daryl. Behind them, however, is where the photo gets interesting as the series heads into uncharted territory. The White House, as it may appear on the show having deteriorated in the years of the apocalypse, is all but destroyed in the background. 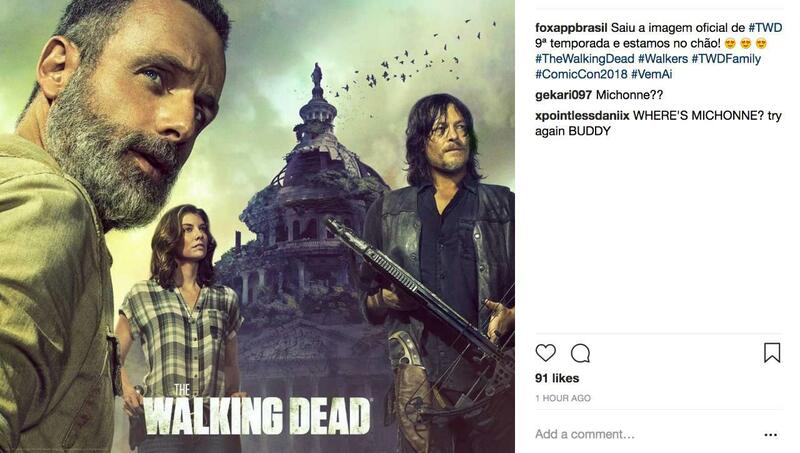 Check out the photo from Fox's Brazil account below! Based on the caption, this would seem to be key art for the upcoming season which will inevitably have more similarly designed photos dropping in anticipation of San Diego Comic Con. Season Nine of The Walking Dead is expected to be the last for Andrew Lincoln, with the Rick Grimes actor having head home after filming the first half of the season. If the Season Eight finale were to have been a series finale, Lincoln might have walked away content with his and the show as a whole's work. After all, it did feel like a series finale to many, with almost all of the narrative threads and character stories being wrapped up nicely. "I think that when we got the news that Carl was dying on the show, it certainly for me, it felt like very much a bookend of a much bigger journey that began in the hospital," Lincoln said in a more recent interview with ComicBook.com. "Searching for his wife and his son were the two engines that kept this man alive at the beginning of the show eight years. To lose the second engine that fueled him, at this point, certainly did feel, to me personally, not just the end of a chapter but a book, really." The Walking Dead will return for its ninth season in the fall. Fear the Walking Dead airs Sundays at 9 pm ET on AMC, returning for the second half of its fourth season on August 12th. For complete coverage and insider info all year long, follow @BrandonDavisBD on Twitter.